Dime-sized ocean organisms thought to graze on any particles in their path are actually picky eaters, and their food-filtering process may be vital to how organic materials are distributed from surface waters to the ocean floor. 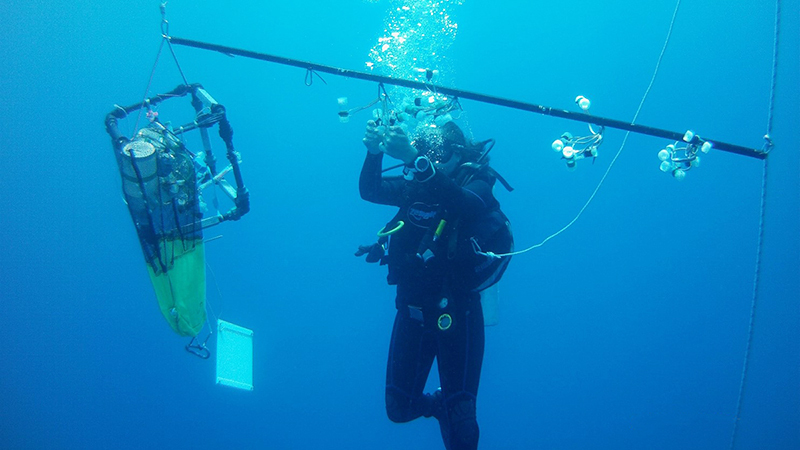 Those conclusions come from three studies, which involved scuba diving in different locations and high-speed videography in the lab, by a UO doctoral student. The research, led by Keats Conley, who earned her doctorate in July, rewrites what is known about appendicularians, said UO marine biologist Kelly Sutherland. These abundant, tiny, gelatinous animals, with a trunk and a tail, resemble tadpoles. They are long known for turning their own mucus into houses that envelope them to filter microscopic prey. Until their mucous houses are deployed, their tiny bodies, less than one-half inch long, are difficult to see. Rather than being general grazers, as long assumed, Conley and Sutherland reported that particle shape of prey matters. In the journal PLOS ONE, it was shown that rod-shaped prey is less likely to be grazed than spherical prey of similar volume. The latter stick easily to both the outer and inner filters of the mucous house and have a harder time reaching the animal’s mouth. In the journal Limnology and Oceanography, Conley, Sutherland and colleagues from the University of South Florida and University of Bergan in Norway found that smaller particles are more apt to get stuck to the mucus house and never reach the mouth. Appendicularians secrete mucous out of their trunks to build their house-like structures, up to 40 new ones daily, Conley said. Discarded houses are used by other microbes after they sink to the ocean floor, where they have long been known to provide food to deep-sea creatures. “Appendicularians inflate their houses by beating their tails, and they live inside of it. It’s like a spherical, bubble-like structure. It is one of the most complex extracellular structures made by an individual organism,” she said. Conley fell in love with appendicularians, she said, after spotting them while scuba diving off France in an unsuccessful effort to find salps during a project with Sutherland and scientists from Israel, France and Germany. That effort went in another direction, eventually leading into a paper in Nature Microbiology that showed surface properties of microbes matter to appendicularians. A Teflon-like surface on SAR11 bacteria does not stick to the mucous houses, likely allowing these ocean-abundant bacteria to slide through the mucous filters to avoid predation. While appendicularians are common throughout the oceans, they have been understudied, said Sutherland, an assistant professor of biology in the Clark Honors College and a member of the Oregon Institute of Marine Biology and Institute of Ecology and Evolution. Conley spent a lot of time in the lab videotaping the appendicularians as they took in large amounts of particle-filled water. Later, she observed them under magnification. Conley’s approach, Sutherland said, provided the closest view ever captured of appendicularians and their mucus houses. While mucus houses are known to have dual filtering systems, Conley’s research focused on just the food-concentrating filter system. The houses are discarded and replaced as the animal grows and the filter gets clogged.